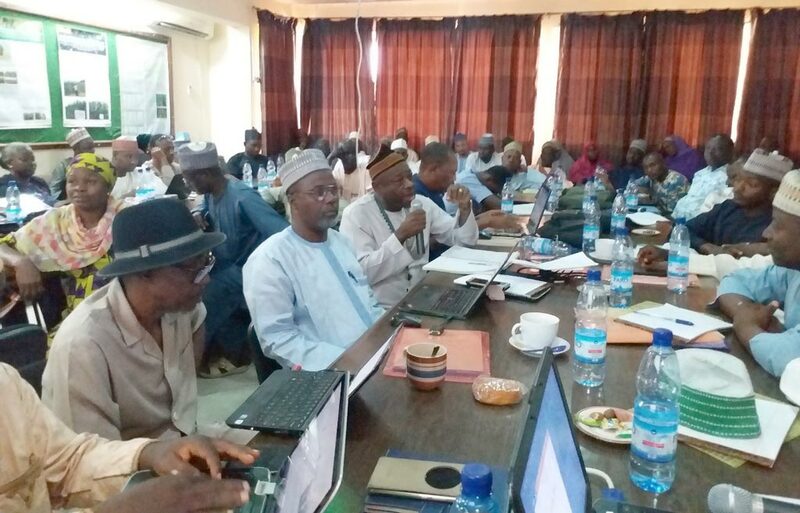 Recently, Tropical Legumes III (TL III) and Harnessing Opportunities for Productivity Enhancement (HOPE II) projects held a three-day, in-country review and planning workshop at IITA, Kano Station. 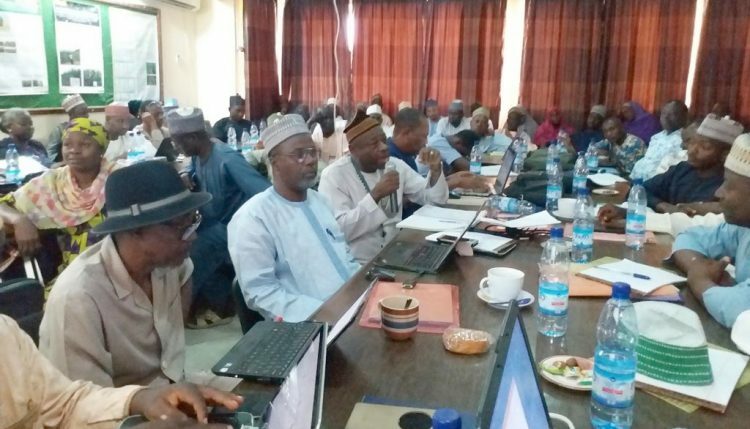 The meeting came before the cropping season to address challenges to increased production and productivity of legumes (cowpea and groundnut) and cereals (sorghum and millet) in Nigeria. It also discussed ways to improve the seed and other technology delivery systems in both crops. The workshop sought to review the activities of the two projects for the past three years, i.e., what worked well and what needed to be improved, and strategize for 2018 activities. Alpha Kamara, IITA representative, Kano Station, in his welcome address, encouraged the project leaders to ensure that the TL III and HOPE II project goals are achieved. He also alerted participants on the emerging pest problem (Fall armyworm) that is threatening the production and productivity of maize in Nigeria and Africa at large. He advised that partners expand their scope of work to proffer solutions to emerging issues, which are of economic importance not just to maize, but a host of other important cereals, such as sorghum and millet. Prof D.D. Yusuf, Deputy Director, IAR/ABU Zaria, acknowledged the support from the Bill & Melinda Gates Foundation and the research and development work of IAR as an implementing partner of the two projects. He also said the Institute will continue to give maximum support toward the success of the two projects. Dr Hakeem Ajeigbe, ICRISAT country representative, encouraged objective leaders to publish their research findings to justify the huge investment from donor organizations in their institute. He challenged project leaders to present publications as evidence of the work they are doing. Dr Lucky O. Omoigui, the TL III Seed System Specialist, thanked all the various stakeholders and institutions for attending the workshop. He also highlighted IITA’s research work in cowpea and assured the NARS of IITA’s continued support in developing sustainable seed systems in West Africa, research to improving food production, and reducing hunger and poverty in Nigeria. Omoigui and Prof Olufunmilola Alabi, Dean, Faculty of Agriculture, ABU Zaria and Coordinator, HOPE II, also gave an overview of the activities and achievements of the two projects. Alabi specifically pointed out that HOPE II activities had placed Nigeria among the leading producers of sorghum and millet in the world. Nigeria also continues to play a dominant role in global cowpea production with over 3.02 million tons of grain produced in 2016 from an estimated land area of 3.5 million ha. This is partly attributed to IITA’s research effort in improving the production and productivity of cowpea in Nigeria and Africa at large, says Omoigui. The welcome/goodwill messages were followed by project updates by various objective leaders. These updates/presentations allowed the participants to appreciate the synergy between the sister projects. The major output of the meeting was a detailed 2018 workplan and seed road-map for the country. The following issues were identified for synergy: the need to leverage resources between the two projects to improve the efficiency and effectiveness of seed delivery; joint capacity building of national partners; and alignment of Gates Foundation seed sector development activities to national priorities. The following were also seen as challenges to increased production and productivity: limited use of data capturing tools by partners, targets in seed production not met largely due to underreporting of seed produced by seed companies; and late submission of project reports by partners. Participants agreed on the need to restrategize to increase seed production and encourage wealthy individuals to invest in legume and cereal seed production. In his closing remarks, Prof O.O. Olufajo of IAR/ABU Zaria expressed gratitude for the success of the workshop and the large turnout of the various stakeholders. He also expressed gratitude for the valuable contributions of the two projects toward addressing the challenges of legumes and cereals variety development and seed production. He shared his hope that the synergy would be a success and provide an example and lessons for other sister projects.